In March 1999 the cover of The Economist carried the bold headline “Drowning in Oil”. In December 1998 the price of Brent crude oil had dipped below $10 per barrel to then lie just over that mark. 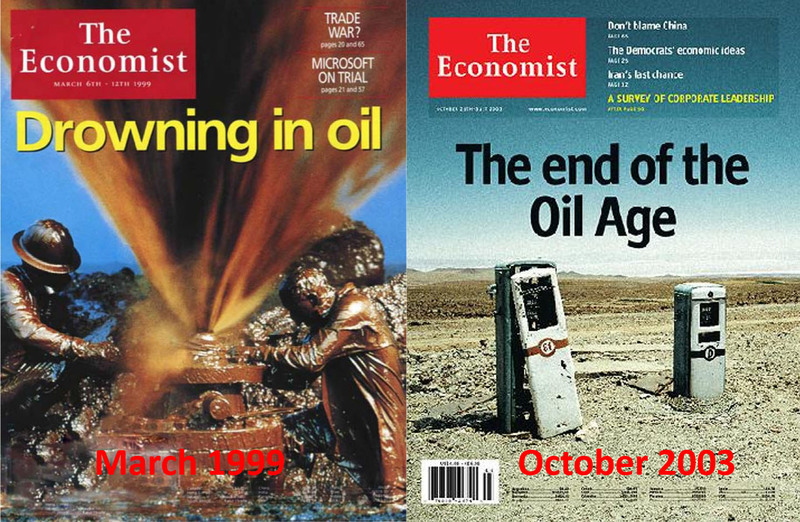 By October 2003 the situation in the oil market had changed and the Economist now carried the headline “The End of the Oil Age”. At that time the price fluctuated around $30 per barrel which was an increase of 200 %. Low prices are usually an indicator of excess supply and high prices are the opposite. Since it has the world’s largest reserves of oil, Saudi Arabia has been the main player in the oil market since the 1960s. The figure above shows that nation’s oil production. As a reaction to the war in Israel, Saudi Arabia closed down production from a number of its oil wells at the beginning of the 1980s. But there is also an additional explanation to why production decreased. Up until 1973 international oil companies owned the right to produce oil in Saudi Arabia but, since the 1950s, the Saudis had forced them to surrender half of their profits to the Saudi government. In 1973 Saudi Arabia took over control of 25% of the business and this increased to 60% in 1974. In 1980 Saudi Arabia bought 100% of Saudi Armco and the international oil companies lost their share of the world’s largest oil reserves. Instead they then made large investments in production from the North Sea. When it became clear to the international oil companies that they would gradually lose control over the production and profits from Saudi oil, they maximised their profits by upping their production to the maximum possible during the 1970s. They did this by pumping in gas at the top of the field to increase pressure. When Saudi Arabia took over control of production the oil fields required massive investments to then pressurise them by pumping in water around the fields’ outer edges. In the picture above you can see the giant oil field Abqaiq (Illustration from Peeking at Peak Oil). The red well is where they have pumped in gas and all the blue wells are those that Saudi Arabia had to drill for water injection to get production moving again after the gas injection. But there is still another factor that caused the oil flood in 1999. That is the dramatic increase in production from the North Sea. However, at the start of the 2000s production from the North Sea began to decline and some of the fields in Saudi Arabia had also passed their production peaks. Oil production in the USA had begun to decline in the 1970s and continued to do so until the fracking boom. The supply of oil decreased and the price rose. The price passed $50 per barrel in 2004 and finally reached $147 per barrel in 2008. In the Autumn of 2014 global oil production was in a situation reminiscent of 1999. Saudi Arabia had finished its massive investments to raise pressure in the Manifa oil field and some other fields, and at the start of 2013 could now raise production by 1 Mb/d. At the same time, the USA raised oil production dramatically by 4 Mb/d by 2014 through fracking. Fracking now played the same role that North Sea production had played during the 1990s. In its recently released report, the IEA now says that the world is once again drowning in oil. By lifting the sanctions against Iran we will first see that they sell all the oil they have stored at sea on old oil tankers. Then they will increase production. Thus Iran will increase the world’s oil supply further. The question is, when will we see a decline in production like that we had at the beginning of the 2000s? In the figure above you can see the scenario that the IEA presented in November 2015. Crude oil production that peaked at 70 Mb/d in 2007 was down at 66.6 Mb/d by 2014 and preliminary data suggests it was 65 Mb/d in 2015. This year it should decrease by 4%, i.e. 2.6 Mb/d. Production from fracking will decrease by up to 1 Mb/d. What will compensate for this decline in production from existing fields is that previously discovered fields will be put into production. However, we know that the willingness to invest in oil production is currently decreasing along with the willingness to fund exploration for new oil fields. The latter means that fewer fields will be put into production in the longer term. My conclusion is that the world will not be drowning in oil but that, like the oversupply in 1999, it will take a few years before the market sees shortage. The question is what will happen to oil demand. One consequence of the current oversupply can be that the shortage in the future will be more severe since there is less investment in new supply. We have already seen that crude oil has passed its production peak and the price of oil will be decisive for the moment in time when unconventional oil peaks. Production of natural gas liquids, currently in oversupply in the USA, is dependent on natural gas production and at the moment they believe that it will increase greatly. If that does not happen then that fraction of oil supply will also fall. To those who believe that we can forget Peak Oil I just want to repeat again that the bulk of the worlds oil production – conventional crude oil – has already passed its peak. Unconventional oil may also have reached its peak when fracking peaked in 2015. The next few years will reveal the truth. From 1999 it took 4 years to go from drowning in oil to the end of the Oil Age. The Norwegian oil field Johan Sverdrup will be profitable if the price of oil is $40 per barrel. Oil that is planned to come into full production in 2020 will presumably be very profitable if we see a similar development to what we saw after 1999. ← Drunknar världen i olja? Good article. I wonder whether you meant to write 1953? You write 1973. Thank you, 1960 should be 1974. It looks like not much changes at the IEA. Is it safe to say that the analysis you did on the oil production forecast in WEO 2008 can more or less be applied to the current one you show in the post? That the expectations for production from yet to be developed and undiscovered are unrealistic. There was also interesting to see the forecast from Erik Wold from Rystad energy in an arcicle in the Oil Age journal. In his forecast there are extremely high expectations for production from undiscovered, with something of the order of 35 mb/d production from undiscovered in 2040. Is that remotely plausible? How much oil would have to be discovered for that to be possible? If this is where the IEA and Rystad belive we will be in ca 25 years it would be interesting, if you have the data available Kjell, to compare it to where we stand now with regards to the last 25 years. That is, how much oil has been discovered in the last 25 years and how much of current production comes from oilfields discovered in that period.